New Video Shows Big Dog Robot Really Jogs, and At 5 mph Too! Kudos to Boston Dynamics for getting Big Dog to jog at 5mph. But do you have to film in front of dumpsters? Nerds struggling under the burden of weighty backpacks, fear no longer, your salvation has come! Big Dog is a prototype “mule” developed by Boston Dynamics for the US Army. 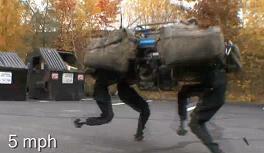 The 240+ lb robot walks on four legs and can carry more than its own weight in cargo. Boston Dynamics just released a new video of the Big Dog jogging untethered across asphalt…at 5 mph! That’s very quick for a walking robot, and Big Dog gets off the ground with every stride. Watch the demo clip of Big Dog below. Most of it you may have seen before, but there’s new footage of the bot as it braves some muddy hills at 1:55 and as it jogs unassisted at 2:30. Walking robots are sort of Boston Dynamics’s thing. Besides Big Dog there’s also Little Dog, which can pick its way over scaled terrain, and Petman, which recently broke 7km/h (4.4 mph) – amazing for a bipedal bot. Big Dog is the flagship of the Boston Dynamics fleet, however, and with good reason. It’s impressive in its recovery from spills (watch it brave icy asphalt at 0:52) and it can really haul across rugged terrain. The goal is for robots like these to travel with soldiers in the field, going anywhere a pack animal would go. I’m not sure if Big Dog will actually be more advantageous to a soldier than a real mule (which could always double as emergency rations), but the walking technology Boston Dynamics develops now could provide the basis for the locomotion of humanoid and animal like robots of the future. That’s pretty awesome. Atta boy, Big Dog. Atta boy.